This is a handwarmer from the world famous lighter company Zippo. 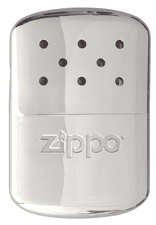 It is a reusable warmer based in the Zippo lighter fluid. To use it you fill it with the lighter fluid, then light it up with a lighter (Zippo for example) and close it; you store it in a pouch that comes with the warmer and put it in your pockets. The warmer will quickly start producing heat and it will continue working for about 24 hours per refill. The refilling process is simple and the fluid is widely available for Zippo lighters and that makes this really reusable compared to other warmers that need a special fuel or more preparation to work. The amount of heat generated is quite good without being hot enough to produce burns or problems, the way the warmer burns the fuel without the generation of flames and fumes is a mistery but we can say it works perfectly well. You can read more and order for $30 from Zippo. This is a new version of the classic military angle head flashlight. The light is powered by two lithium C123 batteries and has a Xenon incandescent lamp as the primary ilumination source, it also has a secondary light source consisting on two white 5mm Leds below the bezel in the light body. The switch is used to activate either the incandescent beam, the LEDs or both at the same time. Runtime is about 1 hour with the incandescent and 10 hours with the LEDs. The light is not regulated so the incandescent beam becomes dimmer as the batteries are used. At the bottom of the light you can find three retractable stand legs. The legs can be used to make the light stand over a flat surface for ambient ilumination, reading, etc. There is a pocket clip in the back that is strong and can be used to clip the light from a shoulder strap, vest, belt or a backpack. The light is provided with 3 filters, red, blue and yellow but they can't be stored in the light itself and that is a disadvantage compared to other angle-head lights. The body is constructed in aluminium and plastic, the construction is good without being outstanding. 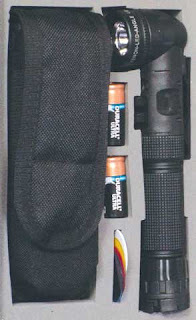 The light is 6.5'' long and weights 6.6oz so. The beam focus can be adjusted from a tight spot to a more floody beam useful as a task light, it is bright enough for the usual tasks for an angle-head light, illuminates well the path when walking and is also useful as a task light inside a tent or a building. The LEDs are particularly useful when the main beam is not needed to save battery power and lifetime from the incandescent bulb. An interesting angle-head light that is probably a very good option if you are looking for this kind of flashlight. You can read more and order from Brigade Quartermasters for $59. This pillfob is one from the many available designs at Jazebra. The fob is made of medical grade stainless steel. The fob we tested was 12mm in diameter by 50mm long, enough for about 6 or 7 standard sized aspiring tablets. The fob has o-ring seals to make it water proof and airtight, the construction is very solid and sleek. The stainless steel attachment point is good for a keychain or neck carry, there is no paint to wear if carried in a keychain. There are models ranging from mini fobs for neck carry to larger capsules that can be used for survival kits or as a water tight container for different things. You can read more and check the different models following this link. Prices from $18.